Some people use the eagle or the wolf as their spirit guide; not Jenni. Today, she has placed her trust, direction and life (and thus mine) into the solid, wizened hands of one Ms. Mable Hoffman, who skyrocketed to fame with "Crockery Cookery" and "Chocolate Cookery". 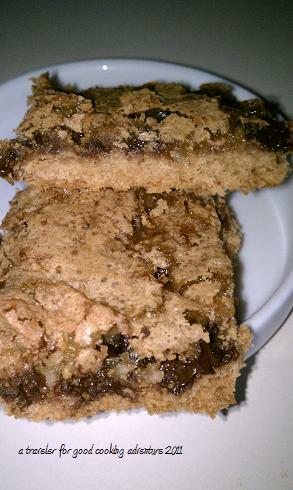 Ms. Mable will live on in our heart and stomach, provided we survive her recipe for "Peanut Butter Dream Bars". Bring it, Mable. And if it is good, bring it on again! I think these turned out fine considering it was my first experience working with Mable. The recipe is described in her book as "An exquisite blend of chocolate and coconut over a peanut butter crust." Preheat over to 350. In a medium bowl blend peanut butter, butter, and brown sugar. Stir in flour. Turn out into an ungreased 13x9 pan (I lined mine with wax paper). Flatten dough with hand to cover bottom of pan. Bake 10 minutes (I opted for 8, it is Colorado after all). While baking, prepare topping. Topping: In a medium bowl beat eggs well. Add brown sugar and vanilla. Beat until blended. Mix in flour, powder and salt. Stir in coconut and chocolate. Spread on baked crust. Return to oven; bake for 25 minutes (20 here) or until golden brown. Cool slightly in pan before cutting. Delicious! Simply delicious! Thanks for sharing.